This reusable painters tape is not like the typical (often ineffective) kind. The edges are lined with a gel polyurethane adhesive that gets into the micro-grooves on surfaces, preventing paint from bleeding and seeping. The result is a sharp, smooth paint line. 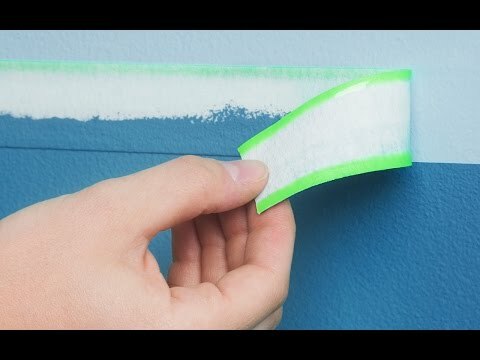 Choose the tape that works best for the job—Specialty Surface for unfinished, primed, or matte surfaces, or Multi-Surface for glossy or eggshell finishes, or anything that’s being re-painted. When masking a line on a surface already painted it's not only important to have a clean line (Snot does that), it's vital that the removal of the mask does not remove the paint on the surface it's stuck to. This tape is gentle and leaves the finish in place. For example, I just sprayed a line of color onto a brass part that already had a coat of paint on it. The line was perfect and the tape came off leaving all the first coat intact. For that application needing just a single line in a small space, cut the tape in half longitudinally. You use half as much tape and you can get into those small spaces. Dave Gruenwald created his own reusable painters tape after an epic struggle to paint his den. The dark red paint he used bled and seeped onto the white ceiling, and no matter what type of tape he used—and he tried just about all of them—he couldn’t get a clean line. Leaning on his engineering background, he came up with ‘SnotTape. What’s special about this Made in the USA tape is the gel polyurethane adhesive that lines both edges. It acts almost like a putty, filling in micro-grooves and gaps (that you probably can’t even see) on surfaces, preventing paint from sneakily seeping in. The result is a clean, crisp line. The gel also makes the tape flexible, so it’s easy to reposition and reuse. It works on many surfaces, from walls to furniture to bricks, and there are different tapes to best suit your project. Thanks to Dave’s struggle, the rest of us can paint sharp lines with less hassle.